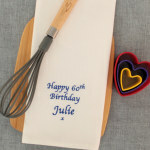 Personalised tea towel with cupcake embroidered with a coordinating message for a truly special gift. Personalised tea towel with cupcake embroidered with a coordinating message for a truly special gift. 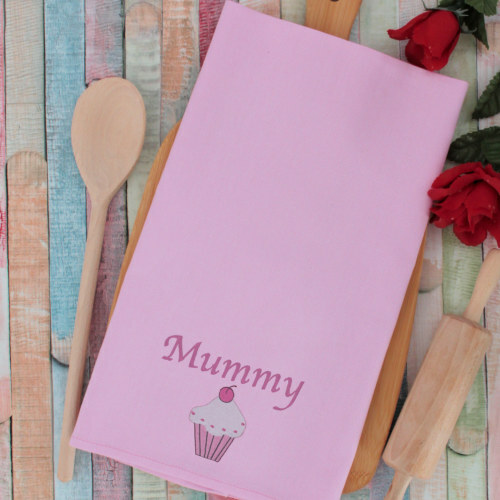 Choose a 100% natural cotton or linen tea towel that we will customise with an embroidered cupcake motif and personalised names or a little message in your choice of thread colour and font style. A good size tea towel at 52 x 72cm. Unique and useful gift set birthdays, a wedding gift, anniversary or Valentines Day! At Amys Gifts we do all our own embroidery work especially made to order and do our best to get all orders dispatched within 2-3 days.